In February 2015 I was invited to the Royal College of Music to see a rare performance by Node, a 'synthesizer supergroup' who's members included two old friends from many years back. The stage was laid out with a wonderful collection of classic instruments from the 1960's and 70's, huge banks of dials & switches wreathed in cables and dotted with little flashing lights. As the concert began the performers seemed more like technicians than musicians, black-clad engineers servicing the great machines, often with no clear indication of which sound was coming from which instrument, let alone which player. The music that emerged was literally unearthly - no hint of string, pipe or drum, this was an alchemist's laboratory where new sounds were crafted from raw matter. There was a familiarity in the resulting timbres but this was in acknowledgement of those pioneers who had been using the synthesizers back when they were new & revolutionary rather than an active effort to be quaintly retro. Or so it seemed to me. As I let the waves of sound wash over me it brought back memories of my own dabblings in futurist music, creating sounds and songs that looked beyond the conventional and explored the possibilities of emerging technology. This, then, is a short history of my wanderings through the badlands of musical expression. In my home years music was something to be enjoyed rather than created - I don't recall anyone in my extended family or social circle who actually played an instrument. There were music lessons at school but these seemed to hammer home the idea that playing music was either incredibly difficult (and purely for the 'gifted') or boring & tedious, a classic example being a room full of adolescents attempting squealing scales on battered old recorders. The music I was listening to at the time was either complex prog rock played by instrumental virtuosi or highly processed pop music from (for the time) elaborate, multi-tracking studios, neither of which seemed a likely progression from my tapping on a glockenspiel in the classroom. This 'music is difficult' idea was reinforced when I pestered my parents into buying me a guitar and found that, yes, you do need to do a lot of work to get something recognisable out of it, certainly more work than my teenage self was willing to put in. But there was still hope! My new guitar was electric and every guitarist I saw on TV had at least one little effects pedal in their setup - maybe this was the answer? 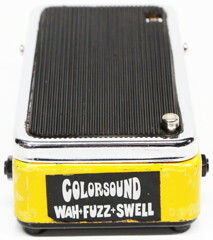 I saved up my paper round money and, on the basis that three was better than one, bought myself a Colorsound Wah-Fuzz-Swell pedal, a huge slab of a thing in garish yellow. Well, it didn't do much for my guitar playing but it did give me a wonderful new toy to play with. While gently strumming or randomly picking at notes I would stomp on the pedal and produce all sorts of strange noises, the fuzz turned my feeble tinklings into a thick mass of sound, the wah filtered it into sci-fi sound effects and the swell (volume) produced rhythmic throbbings as I cranked the pedal back & forth. It wasn't exactly musical (even to my ears) but it was endlessly fascinating and I spent many an hour filling my room (and, at times, the house) with bizarre sounds. Eventually the delights of making a racket on my own started to fade but I was hooked on the idea of playing music and had somehow found the confidence to risk doing it with other people. I settled on the bass guitar, initially as nobody else wanted to play it so there was less competition, and began playing more conventional stuff. My next venture into the avant garde came after seeing a play at my local theatre. One of the actors was providing bleepy sound effects from a small box and after the show I brazenly went up to him and asked what it was, turned out it was a handmade unit put together by a friend of his in Cambridge. An exchange of letters (this was pre-Internet) and a return train journey left me in possession of a similar box of my own. Inside were two tone oscillators (that produced a single note each), two control oscillators (that caused their respective tone generators to rise or fall repeatedly) and a magic button that would link everything together so that the rising & falling would itself rise or fall in frequency. Once again it was more of a toy than a practical instrument but I delighted in finding what strange sounds I could produce from it, one of my favourites being setting both pairs of oscillators just slightly out of sync and letting the tones drift in & out of phase. I really liked the fact that the box would continue to make sounds once I set it up and I could then listen and adjust them on the fly, a great help when trying out something new. Then came a moment of fate that changed my musical life completely - I met Dave Bessell. Over the next ten years or so we played together in a host of bands (often just the two of us), pushing back the boundaries of music and usually doing so on a very tight budget. Dave was a wonderful person to make music with, he would come up with an endless stream of ideas and was amazingly supportive & encouraging as I tried to dream up stuff to accompany them and attempt to produce them reliably from my hotchpotch of gear. The bleepy box produced some wonderful sounds but I needed more tonal variety to think of performing in public. A real synthesizer was way out of my price range so a more lateral approach was needed - what I could afford was effects pedals and so that's what I went for. 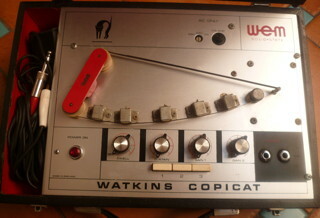 My first addition was a WEM Copicat echo machine, a little loop of recording tape with three playback heads that would give different echo timings. Adding echo really fattened the sound (as well as giving it a spacey quality) and let me play fake sequencer lines - with a long echo time I could play other notes in between the echoes and get an almost syncopated effect. Various other pedals were added, notably a Ring Modulator that was essentially unusable for conventional music (and therefore available at a knock-down price) that I extracted from its pedal and fitted in a tin box. When we first performed as Headroom Dave at least looked the part with his guitar while I sat at a small table covered with random electronics. Looking back at these early performances I'm amazed by my self-confidence and (at least in my memory) proficiency with this lashed-together 'instrument'. Our pieces were generally quite long with Dave's metronomic guitar patterns providing the backbone that I embellished with my bleeps, somehow I not only held the structure in my mind but was able to produce a (reasonably) consistent accompaniment each time, even when new devices were added to my sound arsenal. Sadly no recordings exist of the band, it would be fascinating to hear just what we sounded like. It soon became apparent that I needed a way to play actual notes alongside my bleeps & swooshes but once again the problem was money - keyboards were expensive. 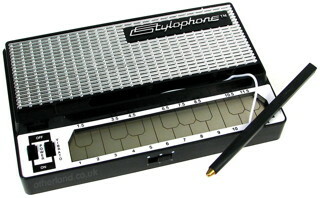 The affordable solution turned out to be a Stylophone, a little toy that was played with a biro-style 'stylus' on a strip of metal etched into 'keys' in a vaguely recognisable layout. It produced a thin, buzzy sound that could be beefed up to an extent with its built-in vibrato but I was able to disguise it into something more exotic through my mass of effects pedals. Suddenly I could play real notes! The downside to having a keyboard (however fake) was my total lack of keyboard skills. I knew the basics of keys & scales from my bass playing and I knew that all the white notes gave C major but that was about as far as it got. Rather than go out and learn some music theory I stuck to the method that had worked for me in the past - fiddle about and see what it sounded like. I'd get the key and chords (if it had any) for a song from Dave, work out the root notes on the Stylophone and then see what other notes seemed to fit. It helped that using the stylus encouraged glissandos of notes as I slid it up & down the keyboard, if the one I ended up on sounded wrong I'd just carry on to the next one until I found something I liked. A real synthesizer at last! The next major addition to our sound came with the addition of percussion. Dave had bought a drum machine (possibly a Korg Mini Pops) that provided cheesy but usable rhythms and, as the person with free hands, I ended up operating in on stage. The various pre-set patterns were selected with push buttons but we discovered that you could press more than one at a time and end up with unexpected combinations of drums. Once again the creative path was to find out what something could do if you disregarded how it was intended to be used, something I've kept coming back to. Out of the blue a wonderful gift arrived - Dave managed to borrow a MiniMoog from somewhere and I had use of a proper synthesizer for a week. Once again my self-confidence rose majestically to the occasion and in that week I not only managed to work out suitable sounds for our next gig (included an extended solo piece) but composed and recorded a song at home, Gotniari (which can be found on my Recordings page). Amazingly I managed to reproduce the bleeps & swooshes from my old oscillator box on this very different instrument, despite thinking of myself as a fake musician I obviously knew what sound I wanted and how to make it. 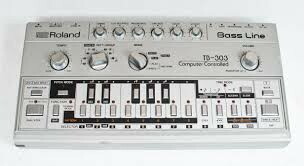 By this point I had drifted into regular employment and had the disposable income to buy myself a real synthesizer. 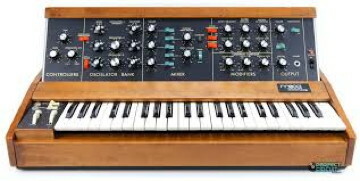 Not a MiniMoog - that was still far outside my budget - but by this time (late 1970's) cheaper alternatives were starting to appear on the market. 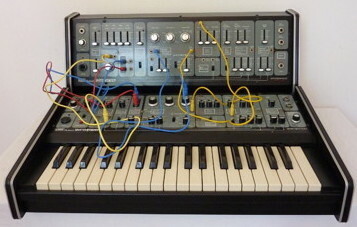 In the end I plumped for a Roland 101, this had the same pre-wired layout as the MiniMoog but also had the option of connecting the various modules together with patch cords to set up new connections between them. I also bought a 102 expansion unit which gave more modules and consequently more opportunity for creative wiring. I had so much fun with the Roland. Played straight it could produce the same sort of sounds as the MiniMoog (although not as full & rich, alas) which allowed me to work on my still rudimentary keyboard skills and become familiar with the possibilites of the various controls. Add some patch cords and it became a marvellous sonic laboratory where all sort of strange noises could be conjured up. Often the most fruitful outcomes came from making connections that didn't make any logical sense - I remember using the audio output from one oscillator to provide the 'vibrato' on another, resulting in a weirdly modulated output. It was around this point that the complexity of the setup started being too much for me to hold in my memory. At gigs I'd have a notebook showing the control positions and patch cord wirings for each song, the drum machine tempo & patterns and the settings for the effects units I was using. I could generally cope if I lost the notebook but it was getting more & more difficult to remember everything when on stage. This was in the days before saved presets and user settings but in retrospect the loss of convenience was matched with a very full understanding of what the equipment could do. At this point I was generally playing what had become the conventional synthesizer style, an obviously electronic sound but used as a regular instrument. However the Dave & Andy partnership still had one more card to play in the search for something way outside the norm - Rhythm System, a live dub reggae band. Dub reggae was a studio-based style where an existing song was radically remixed, taking whole tracks in or out, isolating parts or phrases, and selectively adding huge amounts of reverb & echo. Our approach to doing this live was to have a setup that could (to an extent) continue playing on its own while we tinkered with it. Dave had upgraded to a more professional Roland TR-808 drum machine and I'd added a Roland TB-303 bass sequencer - a machine that could be programmed to play back bass lines in sync with the drums. As well as producing their own sounds we wired the machines together to let them interact, so one of the drums would trigger a note on the synthesizer which would have its pitch set by the bass line, the synth keyboard or a pre-set note. Once a song had been started we would add or remove individual drum or other tracks, change the settings used for the different sounds, or play along with guitar (Dave) or keyboard (me). A final level of abstraction was added by Grizzly on the mixing desk who would add reverb or echo to different instruments as he felt like it during the songs. It was a very different approach to performance. The line between playing and producing (in an audio engineering sense) was blurred, especially as a good deal of the music was preprogrammed beforehand. There was a real sense of being part of a larger, collective approach to creativity where the things I played or adjustments I made could be modified by the contributions of the other members before making it out to the audience. In the early 1990's I moved to London and left my musical collaborations with Dave (and others) behind. As I approached my forties I found I didn't have the drive to find other people to play music with in my new town and began to spend more time working on stuff on my own at home. 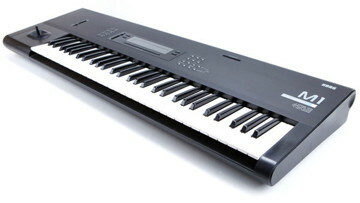 My circumstances had continued to improve and I bought myself a Korg M1, a proper, professional keyboard with capabilities way beyond anything I'd owned before. To augment this splendid instrument I bought software & cables that allowed me to connect it to my Atari 520ST home computer, together this gave me the ability to store settings & sequences and to slowly build up complex pieces by layering several simpler ones on top of each other. The M1 had a very different system of sound generation to my earlier instruments, rather than a simple starting tone that was then processed to make it more 'interesting' it began with a rich, complex tone (usually a sample of an actual instrument) that was filtered to give new sounds. Sadly the programming system was quite fiddly and the tendency was to stick with the preset sounds as they were, especially as they sounded so good. I bought an 'Orchestra' expansion card that gave me an extended selection of classical instruments but otherwise hardly ever made any tonal changes, apart from playing notes that were way outside of the instruments' natural range which sometimes gave interesting results. Most of the music I created with the M1 was more to do with exploring harmony than finding new sounds. I'd choose a single preset sound and build up a piece by adding more & more lines using that same sound. The software I was using (Cubase) let me 'record' my playing on the keyboard and then repeat, transpose and otherwise manipulate the sequence of notes that were then played back through the M1 for actual recording. As with so much of my musical history I tended to use trial & error rather than any theoretical knowledge to find the notes I wanted. After moving to Findhorn in Northern Scotland my musical explorations faded into the background, for a variety of reasons. I was still playing music but it was mostly Balkan folk or rock/blues on very conventional string instruments. However I did find one outlet for my solo creativity when I discovered the delights of looping - using an echo machine to record and repeat a snippet of music that can then have other notes overdubbed onto it. I'd come up with a sparse version of (usually) a popular song where the looped phrase provided the backing that I'd sing and play over, sometimes switching it out to play the chorus manually. At a variety performance in the community hall I built up a piece layer by layer while my then-wife Laura improvised a dance to it, then when it felt nicely full I put the guitar down and joined her on the dance floor while the piece continued to loop behind us. Using an echo machine like this could be nerve wracking as anything I played would immediately come back (potentially to haunt me) but most of the time I managed to stay in the moment and surf the wave of sound. From looping I developed an almost ambient style of playing where I would slowly fade a guitar note into an echo machine set on a very long and persistent delay - the resulting sound would hang & swirl while slowly fading away, during which time I would add more notes over the top and so on. By using different effects and processors I could create a whole host of sounds, none of which sounded like they had anything to do with a guitar. The article Soundscapes of Isolation on my Blogs page describes how I came up with this technique, the track Lifeline on my Recordings page was produced this way. There's a rave on my phone! Once again I entered a bit of a creative hiatus when moving, this time down to Wiltshire. 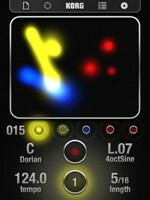 But, as usual, something has come along to get me going again, this time it's an app for my iPhone - iKaossilator. Running it gives you five tracks where you can record, overdub and mix sounds from a big selection of voices, starting from a preset, a saved piece or a complete blank slate. What's novel about it is the method of playing, you tap & swipe on the screen and the position of your finger determines the pitch & quality of the note, not only that but the key is preset so it's (almost) impossible to play a 'wrong' note. Obviously this limits what can be done and at times it can be frustrating to not be able to find a particular note but (for me) this is far outweighed by the sheer fun of tapping away and seeing what you end up with. It's easy to switch between recording, overdubbing & just playing back and it fits very well with my trial & error style of musical exploration. A return to 'classic' electronic music came at Christmas 2015 when I bought myself three Korg Volca mini-synthesizers. These are cheap & cheerful instruments that (mostly) mimic earlier designs but are far less expensive, to the point where I could buy them without agonising over the cost. Six months later I added a fourth one. The Volcas have been wonderful for reviving my solo musical creativity and I've been regularly composing & recording with them ever since. There's more about playing with them on my Life with the Volcas page, including links to the tracks I've recorded. Are there any conclusions to be gleaned from all this nostalgia? My approach of "I don't know much about music but I know what I like" has served me well over the years, as has my determination to play things that I like rather than try to please everyone else. Obviously this hasn't helped me build up a sizeable fan base but I don't think I was ever cut out to be a jobbing musician and my history of odd little bands and bemused audiences has given me some great joys through the years. I think my experimental approach to instruments & equipment has been at the heart of my creative process and my willingness to see what something will do rather than what it should do has opened up all sorts of sonic doors, some of which it's been worth going through to explore further. And there's something very special about finding people who share my strange tastes, either as listeners or fellow performers. It's good to know you're not alone.